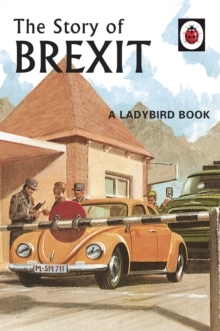 Whether Brexit makes you laugh or cry, Ladybird's The Story of Brexit will just make you laugh. __________________________________' "Leaving was the will of the people," sighs Angelica's father. He voted to leave. Angelica voted to remain, but she feels the same way. "It is the will of the people," she sighs. They stare at the ducks. They like the ducks. Ducks are better than people. '__________________________________'Brexit gave us lots of exciting new words, like brextremist, remoaner, bremoaner, remaybe, breprehensible, remaintenance, brexorcist, remaidstone, brex-girlfriend, remange, brextortion, remayhem and bregret. The new words make it harder for foreigners to understand what we are saying. In a tough, new international business world, small advantages such as this can be crucial. '__________________________________This delightful book is the latest in the series of Ladybird books which have been specially planned to help grown-ups with the world about them. The large clear script, the careful choice of words, the frequent repetition and the thoughtful matching of text with pictures all enable grown-ups to think they have taught themselves to cope.